All things good in the world are coated in salted caramel and chocolate. Ok…fineee…may be not all things. But definitely good things. 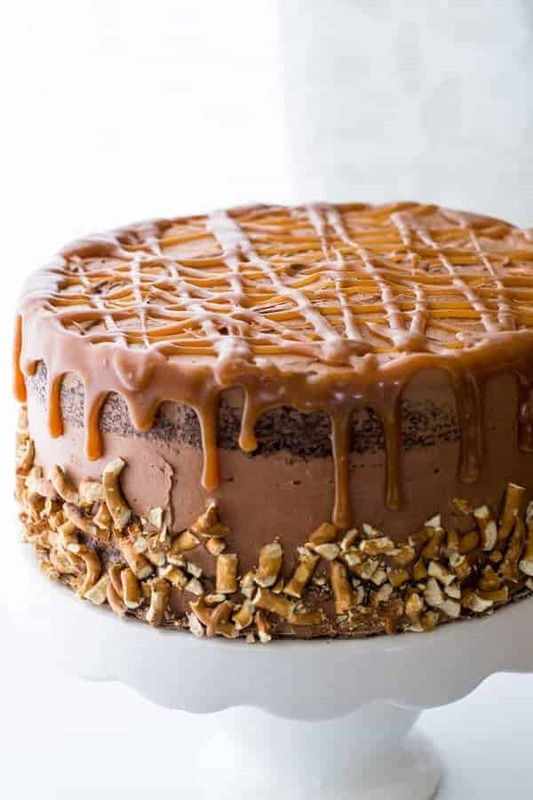 Good things like this Salted Caramel Pretzel Cake. In the realm of dessert, there’s just so much to love. Especially if that sweet tooth runs deep. Who’s with me? Kale smoothies are a breakfast go to, but seriously crushing some cupcakes piled high with frosting is not out of the question. Please Note: This post is not sponsored, but you will find affiliate links listed on this page. The price you pay at check out does not change, but I may make a small commission based on your purchase from the link! Thank you for your support of Hunger|Thirst|Play! Can we just talk about the union of sweet and salty for just a minute? 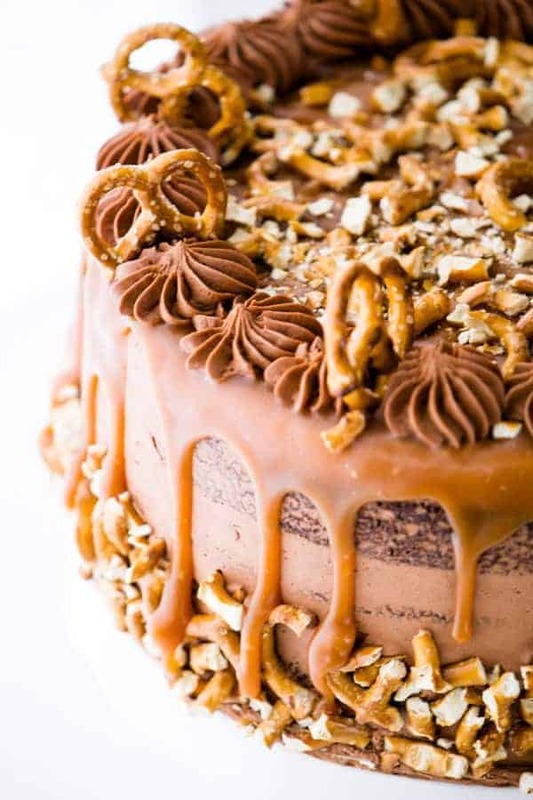 Particularly the perfection that is the salted caramel in this Salted Caramel Pretzel Cake. Creamy, gooey, thick and sweet toasty vanilla flavor of this luscious confection hit all those sweet spots on your tongue. 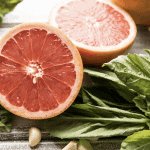 As the tasting process comes to a close, that perfect little zip of salt hits those taste buds right in the back of the tongue for a flavor combination of heavenly quality. Why stop there if we don’t have to? Then let’s not. 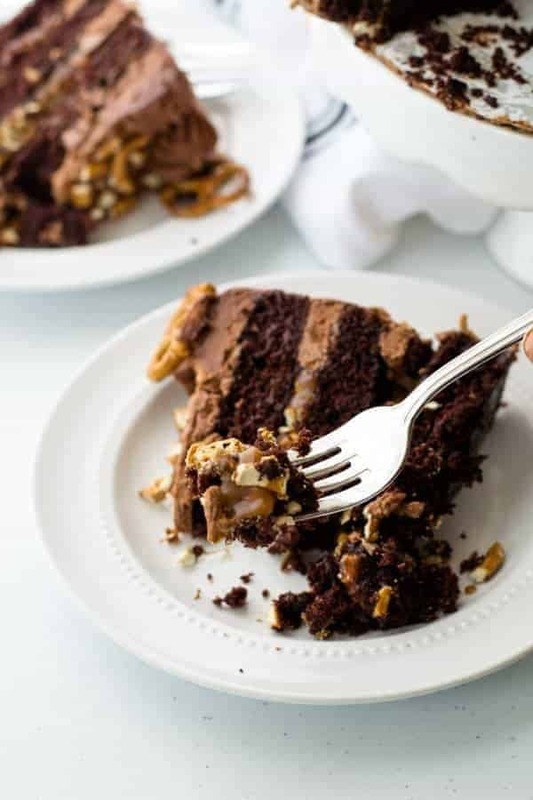 Salt coated pretzel pieces are going to be the perfect addition to this sweet, chocolatey cake. Besides, taking a kitchen mallet and purposely breaking up those perfect pretzels is just plain fun. 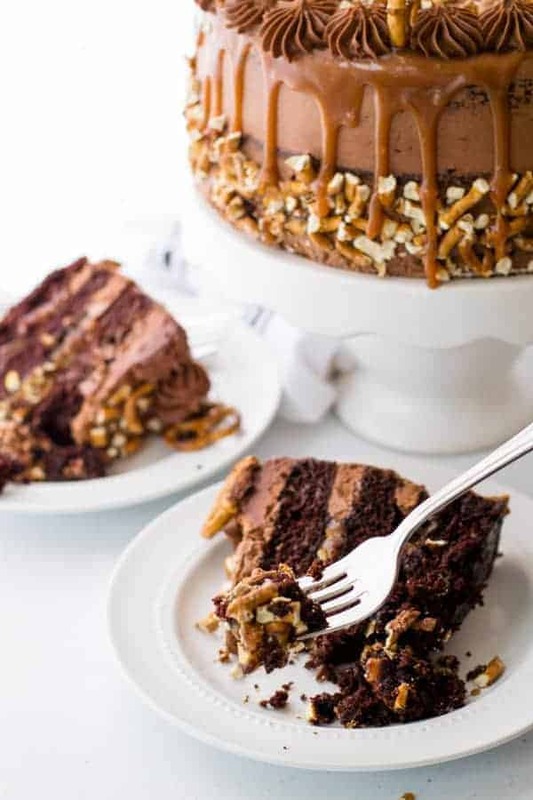 This Salted Caramel Pretzel Cake packs some serious wow factor. Rich, ultra-moist chocolate cake, three layers deep. This is the best chocolate cake. 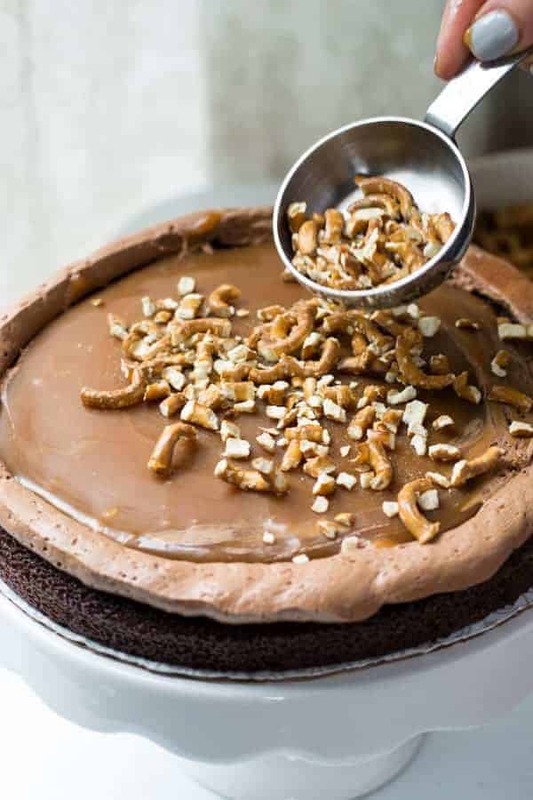 A take on the ‘Australian Mud Cake’ style of chocolate cake, the combination of milk, boiling hot water and espresso powder unite super hero forces to create a stable, decadent, chocolate forward cake that isn’t overly sweet and incredibly tender. But…yep there’s a but. Though the cake is simple to bake and cool. [Insert your higher power]’s honest truth? This cake assembly is not for the impatient. Milk chocolate frosting will require some waiting to cool. Salted caramel requires a candy thermometer, time to cool, and stirring in cold butter one tablespoon at a time. The result? EPIC. CAKE. AWESOMENESS. So, while the intention is not to scare you, but to prepare you that this cake does require either a prep-in-advance style or at least 3 and 1/2 hours for start to finish completion. There was a plan. 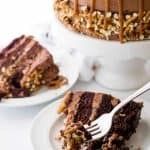 A plan for a really awesome video showing how to make the salted caramel for this Salted Caramel Pretzel Cake. Unfortunately there was a technical mishap and in the process of free-ing up space on my iPhone the caramel burnt and Shea woke up from her nap. Some day soon though, this paragraph will not exist and video will live here instead. The salted caramel for this Salted Caramel Pretzel Cake does need a candy thermometer. This candy thermometer available on Amazon will work perfectly. Apologies for the extra equipment in advance, but without that perfect temperature of 238°F, you’ll end up with layers of cake slip-sliding all over the place like a cute little puppy trying to run a hard wood floor. Getting that salted caramel is key to stability and a not too runny drip over the sides of your ‘naked’ cake. At first judgment, milk chocolate may sound sweet for a frosting but this blend of cocoa powder, melted milk chocolate and just a bit of confectioner sugar are a perfect match. 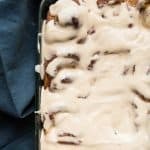 Light and fluffy, bringing lots of chocolate flavor without the super sweet normally associated with a confectioner’s sugar based frosting. To build this, you’ll need to melt one bag of milk chocolate chips. I highly recommend using the double boiler method. 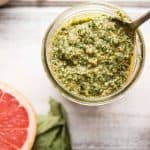 This just means that you use a medium sized sauce pan and fill it with 1 to 2 inches of water. 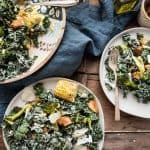 Place a bowl over the top – I use glass or metal depending on the size needed – and when the water is simmering, add the chocolate chips to the bowl. Stir once they start to melt. There are definitely ways to do this in the microwave, but I’ve never accomplished this successfully. If you do try either method and your chocolate does seize, try this trick from Foodal for saving your seized chocolate. The key to perfecting this frosting is to let the chocolate cool entirely, about 15 minutes. Otherwise hot melted chocolate leads to melty butter and the requiring of additional confectioner’s sugar to stiffen. Once your pieces to the puzzle of Salted Caramel Pretzel Cake are complete, it’s time to get the show on the road. 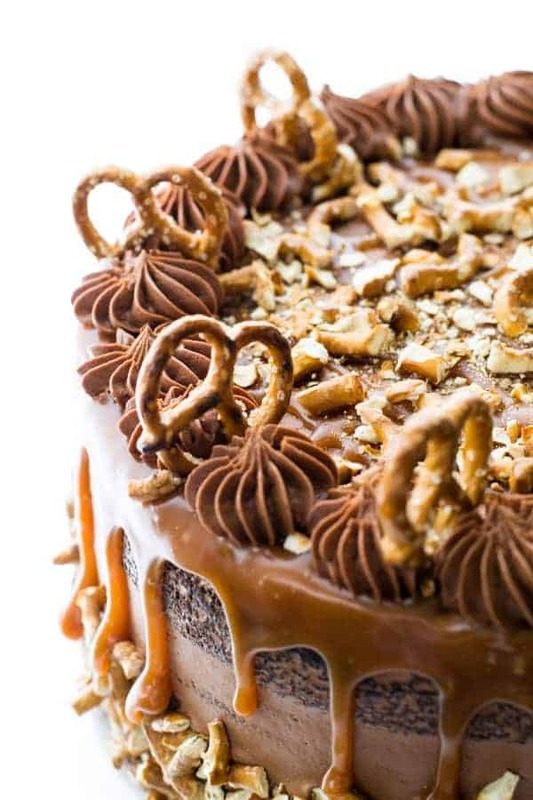 Here are a few tips for making the perfect Salted Caramel Pretzel Cake. Put a little smear of frosting on the cake display or cardboard you are using. This will keep the base layer locked in place. Pipe an outside layer of buttercream to contain the caramel. Ooey, gooey, caramel will spread quickly once there is weight placed on top. A little barrier of butter cream serves as a ‘moat’ to keep your layers right in place. 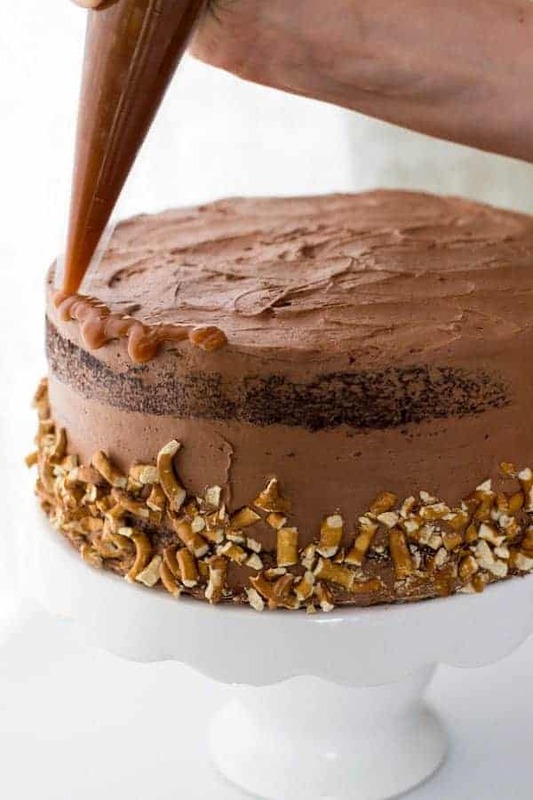 Once the cake is frosted, refrigerate for 10 minutes before adding the caramel drip. This will solidify the buttercream frosting so the weight of your caramel won’t weigh down the frosting on the top of the cake. 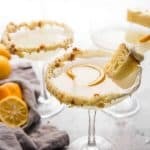 If you plan on a mostly naked cake – top and bottom – where as this cake is simply naked on the sides, then no refrigeration is necessary. To replicate the top of this cake as in the photos, complete the drizzle of caramel along the outside. Then zig zag the caramel over the top. Sprinkle with broken pretzel pieces. Using a Wilton Star Tip , pipe along the outside. Insert a whole pretzel piece every 2-3 stars. To avoid soggy pretzel layers, this cake is best prepared the day of service. If preparing in advance, crush the pretzel on the small size to avoid super soggy or stale bites. With tips in hand and sweet treat dreams ahead, this cake will bring down the house. Friends and family will be talking about this for gatherings to come. But that’s if you decide to share. Sharing not required. You can tell them the recipe says so. 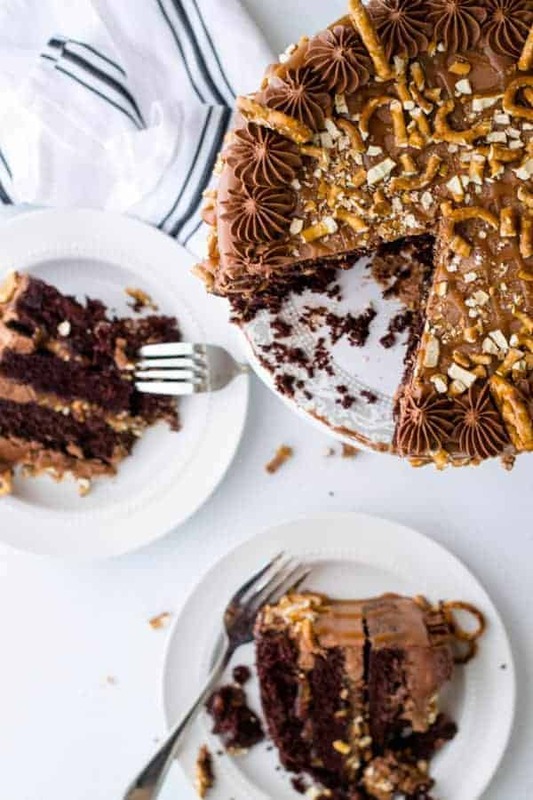 The mother of all cakes – rich, soft chocolate cake, layered with salted caramel, crunchy pretzel pieces cloaked with a naked style milk chocolate buttercream. Grease and flour* 3 9-inch baking rounds. Preheat the oven to 350°F. In a mixing bowl, add flour, sugar, cocoa powder, baking powder and baking soda. Mix until combined. In a large sauce pan, combine granulated sugar and corn syrup. Mix over medium-high heat until combined and mostly liquid. Cook for 10 to 12 minutes, without stirring, until mixture becomes a dark amber color. Once a dark amber color is achieved, remove from heat. CAREFULLY pour in heavy cream and stir until smooth. Mixture will bubble and steam during this process. Return to medium-high heat and cook until mixture reached 238°F on a candy thermometer, about 2 minutes. Pour caramel into a heat proof bowl. Stir in kosher salt and let cool 15 minutes. After the caramel is cooled, stir in the cold butter one tablespoon at a time. Add the next piece only after the previous piece is fully incorporated. Once all butter is incorporated, let cool another 5 to 10 minutes before decorating the cake. Using a double boiler, melt the milk chocolate chips. Once melted allow to cool fully before incorporating into frosting, about 15 minutes. In a small bowl, whisk together 1/3 cup + 1 tablespoon cocoa powder and 1/3 cup + 1 tablespoon warm water. In a standing mixer, beat butter and a generous pinch of kosher salt on medium speed until pale and fluffy. Add confectioner’s sugar and mix for an additional two minutes. Slowly incorporate the melted milk chocolate and mix on medium speed for two minutes, scraping down the sides of the bowl. Add the cocoa powder mixture to the bowl and mix on medium speed a final two minutes until fully incorporated. Transfer to a large piping bag fitted with an open tip. reserve 1/3 for an additional piping bag fitted with an open star tip. 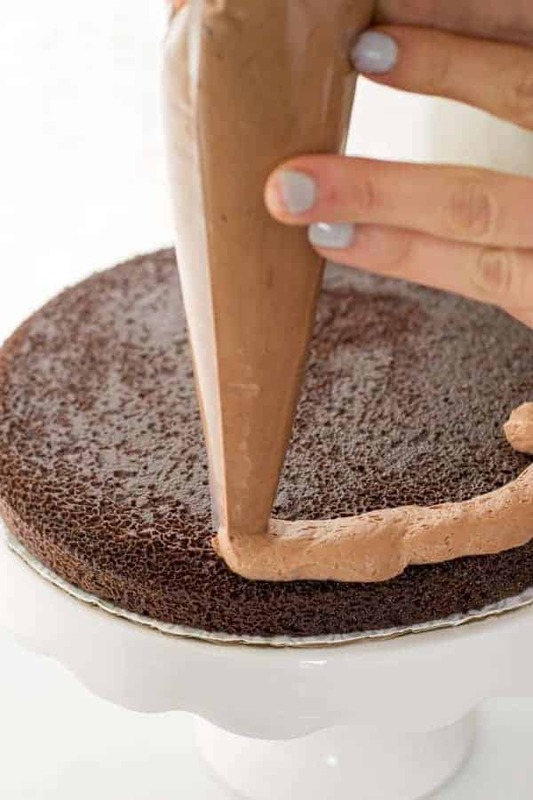 Pipe a small dollop of frosting on the cake stand or cardboard to prevent the bottom layer of cake from moving. Pipe around the edge of the first layer. 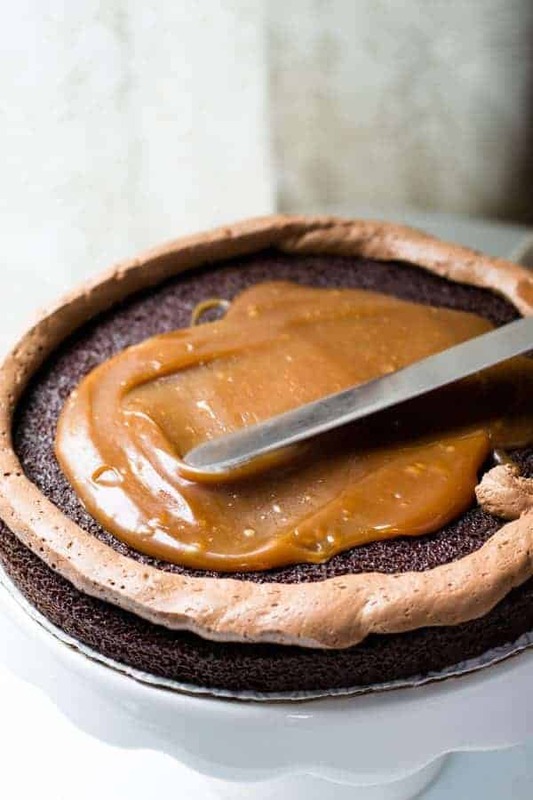 Add 1/2 cup of salted caramel inside the piped area and spread with a heated flat spatula or decorators tool to smooth out. It doesn’t need to reach the edge completely, the weight of the top layers will smooth it out. Sprinkle 1/2 cup of the broken pretzel pieces over the caramel layer. Repeat this process for the second layer. Top with the third layer of the cake. Pipe the top of the cake and lightly around the outside. Smooth the frosting and scrape down the sides for a ‘naked’ cake look. 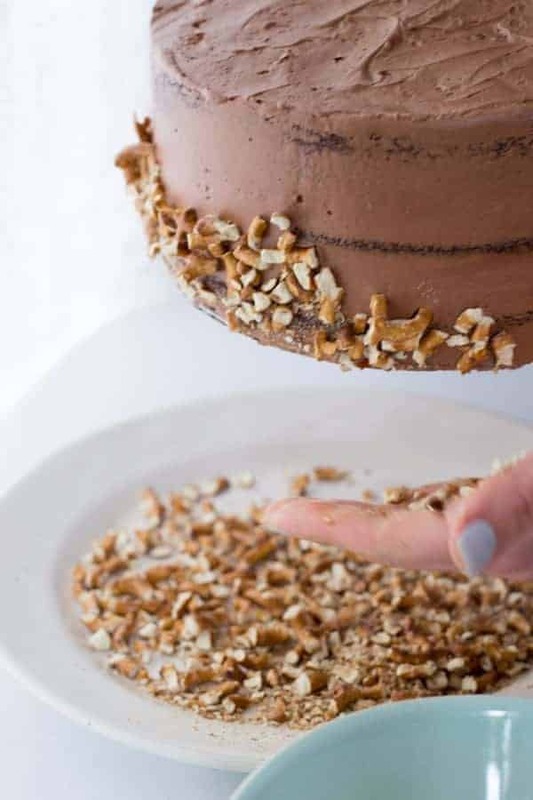 Working over a large plate or bowl, gently press broken pretzel pieces on the bottom 1/3 of the cake. Refrigerate for 10 minutes. 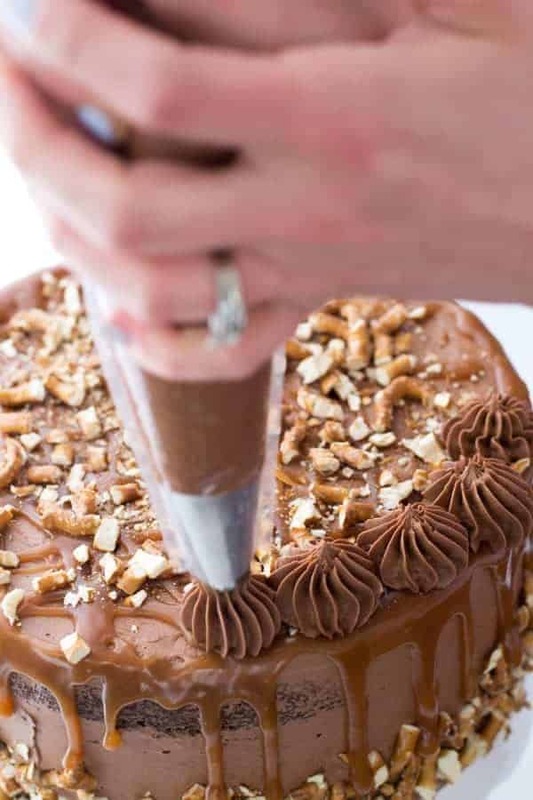 Using a small open tip, pipe the outer edge of the cake so the caramel cascades in a ‘drip’ style over the edge. Finish the top with various zigzag patterns. Sprinkle with remaining broken pretzel pieces. Refrigerate for 5 minutes to solidify the caramel before additional piping. Using the reserved Milk Chocolate Buttercream fitted with the large open star tip, pipe small to medium sized stars along the out edge of the top of the cake. Finish with placing a full pretzel in-between every 2 to 3 stars. Store at room temperature until service. Enjoy that day to avoid pretzels become stale or soggy from refrigerating overnight. *Goop is an easy and fail proof alternative to greasing and flour baking pans. For all that is good and wonderful and beautiful in the world…this cake is like a toast to all of those things. 100 percent beautiful! Please excuse me while I go make one of these cakes entirely for myself. Seriously, this looks A.MAZ.ING. What a beautiful looking cake.